This entry was posted in Environment and tagged climate change, global warming. Bookmark the permalink. ← Sparkassen — A De Facto Glass-Steagall? The tilt of the earth axis is not static. It wobbles. Combined with solar cycles, I do not believe man can influence climate change. I do not think the temperature records are accurate enough to use as data. I highly doubt the accuracy of the temperature rises recorded over the last 100 years. My vegetable garden failed to grow this year, despite lots of sunny weather and plenty of water. In fact over the last 3 months of summer we had no rain at all (High barometric pressure anomoly). 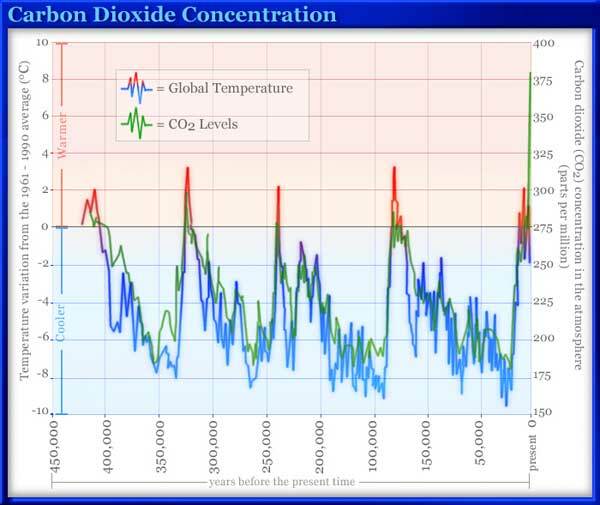 And if you assume we have rising CO2 levels then this does not make sense. Many other local gardeners reported the same thing. I propose a hypothesis: The barometric pressure has an influence over plant growth. Plants will not grow, despite sun and water, unless the pressure drops. Perhaps we could learn from building greenhouses that are vacuum sealed, allowing a pressure drop to stimulate growth. It will help with terra-forming and herba-forming Mars. Combined with solar cycles, I do not believe man can influence climate change. Are you saying that increasing the total levels of carbon dioxide in the atmosphere from pre-industrial levels will not influence climate? Of course altering a sensitive system like the atmosphere will have palpable effects. Causes have effects. Just because there are other factors in the equation does not mean that what humans have contributed is irrelevant. The evidence clearly shows that humans have caused a small reversal in the temperature trend since the industrial revolution. Which, as it turns out, may be a good thing as the pre-existing trend was one of global cooling. I agree with Buddy. Solar cycles are the main influence. We have events occurring on a geologic time scale over millenia. There have been at least four ice ages lasting tens of thousands of years. That is surely a bigger threat? Just because solar activity is the main influence doesn’t mean that smaller variables like carbon dioxide levels cannot have a real effect. The pre-existing trend if we look into the data was one of global cooling. We were most likely heading for a new ice age. My point is that the post-industrial carbon emissions have offset this effect, preventing a new ice age. A blessing? Do you mean like other nonevents like not getting hit by a car? I think that we can reduce CO2 to preindustrial levels using either the modern solution of carbon scrubbing, or even the not-so-modern solution of algae farming if necessary. There is probably some more warming in the pipeline, and probably some negative effects attached to this (although perhaps not as many or as much as is widely theorised due to the countercylical nature of the warming) but so long as we can carefully manage the CO2 level and keep it below 500ppm, which is becoming more technically and financially feasible, I am not excessively worried. I don’t think there is any doubt that there is more to climate variability than just human CO2 emissions. The solar cycle certainly plays a very large role, and cosmic ray effects may play a role too. Nonetheless, CO2 very clearly has some link, as shown by the strong correlation between historical temperatures and historical CO2 levels. The biggest affect of CO2 is the acidification of the oceans. This is causing reefs to dissolve and collapse. Not true. Coral Reefs are forming in new areas. Significant Anthropogenic Atmospheric Warming is a modern myth, hoax, fraud. I don’t recall any reported scientific finding of what warming contribution actually is from AAW or what contribution would be “significant”, but I believe it’s well established that it is lowest in a list of warming/cooling influences: solar activity, other extra-earth phenomena*, ocean currents, atmospheric H20 and CH4, non-anthropogenic CO2. Human history (hundreds of years) and geologic history (tens of thousands of years and more) support the above conclusion. Are the plotted Mann, Marcott data from the UN (UK investigators’) reports exposed as blatantly fraudulent? * Including earth-axis wobble mentioned by Buddy Rojek and the proximity of massive Jupiter & Saturn. http://edition.cnn.com/2013/03/08/world/world-climate-change — Marcott study is out of Oregon State and Harvard. Let’s assume that you’re right and that the fact that humans have increased atmospheric CO2 levels by 33% has had no effect on climate. Whatever caused the post-industrial temperature increases has still held off an ice age, which is a beneficial thing. Personally, I think humans are making a big contribution to temperatures. I think that so far most of those effects (slight temperature increase) have been beneficial, and so will not have catastrophic effects long as we don’t increase levels much more, and develop technology that will help us stabilise and eventually decrease levels. 2. Speaking of correlation (NOT causation): (a) what is the change in TOTAL* greenhouse gasses from a 33% increase in the CO2 component? And what is the effect of all greenhouse gasses relative to solar, etc. (b) I believe that there is a recent study arguing that higher temperature CAUSES more atmospheric CO2 from oceans (and plants?). Yes, the Mann study was the one where there were serious questions over integrity, although I don’t think Mann’s findings are completely wrong as they are consistent with Marcott. To me that looks very much like there are other factors, of which CO2 levels are probably one (as they have risen to very high levels relative to recent history). What is the change in TOTAL* greenhouse gasses from a 33% increase in the CO2 component? Carbon dioxide is estimated at contributing between 10% and 25% to greenhouse effect. So the human increase (around a third of the total CO2) would provide a small increase to the total level of greenhouse gases, consistent with the small rise in temperatures we have seen in the last half century. I believe that there is a recent study arguing that higher temperature CAUSES more atmospheric CO2 from oceans (and plants?). Yes Planets do have an affect on the Earth. Pagans treated them as gods for good reason. I’m not sure of the anthropogenic climate change (I’m also a social-liberal, go figure). Even if we assume that our data is 100% exact, we still need developed theory and models to process it and arrive to conclusions. Given that Earth climate is a very complex, self-equilibrating yet chaotic system, to separate the influence of the anthropogenic emissions of the CO2 from the influence of the plethora of other factors, one needs a VERY good model indeed. I don’t think that we’re there yet. I find it curious that some leftists are always ready to distrust mainstream economic theory, but habitually treat climatology as the Word of God. Still, curbing the burning of hydrocarbons would be nice anyway: it releases a lot of toxins in the air and creates more radiological hazard than all nuclear plant catastrophes. The real problem is that you can’t have your cake and eat it too. The unprecedented wealth of the Golden Billion is founded on the equally unprecedented energy consumption. Some people in Africa could afford maybe some hours of electric lighting a month. An average member of the First World, on the other hand, heats the atmosphere with dozens kilowatt-hours of energy from their consumer electronics, cars and house heating. Everything made from the modern materials like aluminum or plastics require a shitload of energy to just produce. So, all in all, I find it fascinating when the tenderhearted decry what a crime is being committed on the Nature. Sure it is. And you are the perpetrators. Climate models in themselves are pretty awful, I’ve written a fair amount on that in the past. Still, hard for me to not surmise that a large increase in CO2 (circa 33% on preindustrial levels) will not have some effects, probably (given the correlation and given the greenhouse effect) warming. As for the sun, I think it has a large effect in the long run. Cosmic rays have some effect. Non-human greenhouse emissions and other atmospheric phenomena (oceans, forests, volcanoes, etc) have a large effect. And the dynamics of the system are simply unpredictable — any climate scientist who tells you that their long-term predictive climate models work is either a fool or lying. Many climate scientists will be surprised that the Marcott data shows a pre-existing cooling trend, for example. There are lots of dynamics in play here. But I’m still pretty sure humans are having some effect, and the correlations do tend to support this (how large this effect, the extent of its long term implications, etc, nobody really knows). So with a complex dynamical system like the climate, it is one of those things that we should probably be very careful with disturbing. My guess is that we have gotten very lucky with our carbon emissions. 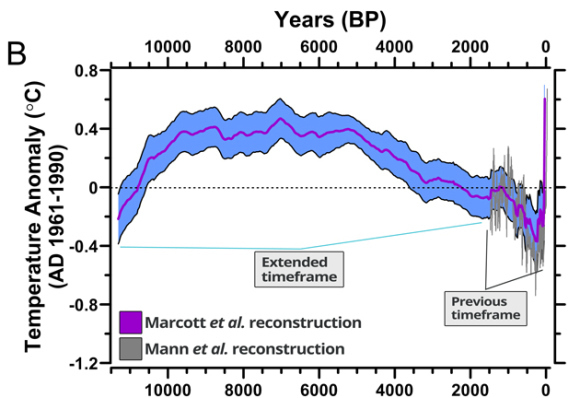 Had they occurred 12,000 years ago, we might have seen much more severe warming than what we have already. I think you have already declined to endorse government subsidies for solar and wind, and have expressed openness to safe nuclear. Will you also disavow the corrupt system of carbon penalties, credits and exchanges? BTW, John, your prompt and laudable responses did not include anything on the effect of TOTAL greenhouse gasses relative to non-greenhouse effects. If anthropogenic CO2 is 3% to 8% of greenhouse gasses, what is the effect on temperature? Will you also disavow the corrupt system of carbon penalties, credits and exchanges? Does that sound like the kinda thing I’d support? I don’t think I’ve written a post on it (closest I have come is this — https://azizonomics.com/2012/06/24/free-market-ecology/) but honestly I think carbon credits/carbon exchanges are possibly the most corrupt, vile, bureaucratic wasteful piece-of-trash idea around today. It’s also a massive bubble risk. I think the solutions to these kinds of issues are technological in nature — technologies that can create jobs and profits, not profit-sapping, job-destroying bureaucratic poison. If anthropogenic CO2 is 3% to 8% of greenhouse gasses, what is the effect on temperature? Small but real effect on temperature, but possible that this small effect is beneficial (i.e. preventing an ice age). Nitpicks — when your “real” effect can be quantified even roughly, please let us know; “technological” solutions are really economic solutions, as you point out in your linked June 2012 article. Attaboys — speaking of that June 24, 2012 post, I say this: when you teach me investments to make me rich, and when you show me a US birth certificate, I’ll finance your run for president. Oh — you would have to be 35 years old. Well, we can ignore the Constitution as the Democrats regularly do, or amend it. Seriously, it’s super!!! Accumulate Bitumen.. Bury it deep and top layer with topsoil.. Grow crops and mine it when needed. John, Every minute more and more scientist and historical data analyst are debugging Marcott’s claim that we are in the throws of before never experienced climate change. Marcott continues (this is not the first time) to rewrite or ignore historical data to sensationalize the recent exaggerated spike in temps. I am pleased to see your lack of panic during the discussion. Nice job! I think we’re over-focusing on the easy-to-quantify negatives, while ignoring the hard-to-quantify positives. What part of preventing an ice age isn’t beneficial? Once you realise that that has most likely been the macro-level effect, you will see the evidence a little differently. Excellent site. Plenty of useful information here. I sending it to a few friends ans also sharing in delicious. And obviously, thanks for your effort!